Professor Jocelyn Lai, known as one of the youngest creative talents in classical music in Canada, performed on the piano at Lang Recital Hall last week, treating students in the audience to passionate renditions of Joseph Haydn, Jaques Hétu, Maurice Ravel, Franz Schubert, and Isaac Albéniz. Lai has competed on the most prestigious stages of classical music, such as Weill Recital Hall at Carnegie Hall, Chan Centre for the Performing Arts in Vancouver and Paul Recital Hall at The Julliard School. The Vancouver talent also serves on the music theory faculty here and teaches piano at the Julliard School. In a short interview after her performance, Lai shared that her passion for piano was apparent at the age of 4 when she started playing the piano. As a result, Lai has been in music schools for the vast majority of her life, and she is now pursuing her doctorate in musical arts at CUNY Graduate Center. Lai opened her show with “Piano Sonata No.55 in B-flat Major” by Joseph Haydn. As she played each note, it was as if the melody guided every part of her body movements. This first piece was very cheerful, like out of a fairy tale. Lai hands were like children on the playground, skipping and running across her keyboard and seeming to enjoy every note. Students in the audience came just for the pleasure of the experience. “Recitals are a great opportunity to get to know classical pieces,” said Dennis Ma, a chemistry major. He said that being a chemistry major can take up a lot of stress and he likes to escape with music. Ma also added that his mood changed throughout the recital depending on the piece that Lai was playing. Freshman Malika Miroea attended the recital in order to complete her music report for her class. she said and enjoyed it much more than she had predicted. 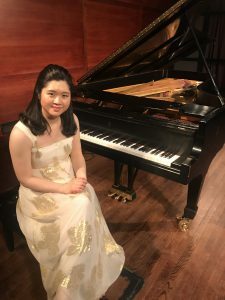 “I was not expecting such an amazing performance with a lot of emotion.” It was a different experience for her to see a professor do a recital instead of students. “Professors have a lot of knowledge to share,” said Miroea who also added that it’s great to be able to attend this kind of events right on campus for free. Lai closed with “Triana” by Issac Albéniz, a song named after a city in Seville, Spain, “known for vibrant colors and flamenco culture,” Lai added. “It’s a fun piece that evokes a lot of character,” Lai said. She said she thinks the piece is like a man who wears a lot of cologne, walks with arrogance and swagger, who falls in love with any women who’s willing to give him some attention.